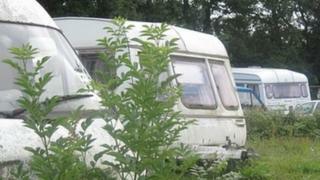 Councillors want to spend £450,000 to set up temporary Gypsy and traveller pitches to combat illegal sites. Residents have criticised Central Bedfordshire Council for failing to deal with traveller-related issues. Now the authority also wants to set up a Gypsy and traveller unit at a cost of £500,000 for two years. "People won't necessarily welcome these potential sites with open arms," director of community services Marcel Coiffait told councillors. Mr Coiffait said the new sites would solve the problem of unauthorised encampments and would benefit local people. A report to the council's sustainable communities scrutiny committee said the local authority wanted to take a "more pro-active stance on a range of Gypsy and traveller issues". Most of the 38 permanent sites in the area caused "no problems", according to the council's head of community safety Jeanette Keyte, but the committee heard there had been difficulties in some, including two in Billington, according to the Local Democracy Reporting Service. She said: "Challenges include breaches of planning permissions, absence of licensing, sub-letting, criminality, infrastructure and local community impact." Conservative David McVicar, chairman of the committee, called it a "thorny problem" which was "not going to go away overnight". He said: "We are now moving in a far more positive direction than we have done in all the years I have been involved with Gypsy and traveller incursions. "I certainly hope our MPs will have some success with pushing through legislation in Parliament to make unauthorised encampments a criminal offence." If approved by the council's executive, there would be 35 temporary pitches for caravans in the south of Central Bedfordshire and 15 in the north. The pitches could be used for 28 days, with a deposit taken and rent charged.